I was reading a story on the thestreet.com today which references information regarding a possible announcement Tuesday. Speculation says that what they will announce may be something about StarOffice, Sun's "Desktop Productivity" suite. This would indeed be very exciting and I'm looking forward to what may come tomorrow. One of Google's domains, "GoogleSun.com", I thought would be an interesting one to take a look at today... I cant seem to reproduce this behaviour on many DNS servers except the one I use on a regular basis, but when I do a lookup on googlesun.com, it acts as though it's partially resolving... could they be getting ready to release a product called "GoogleSun"? 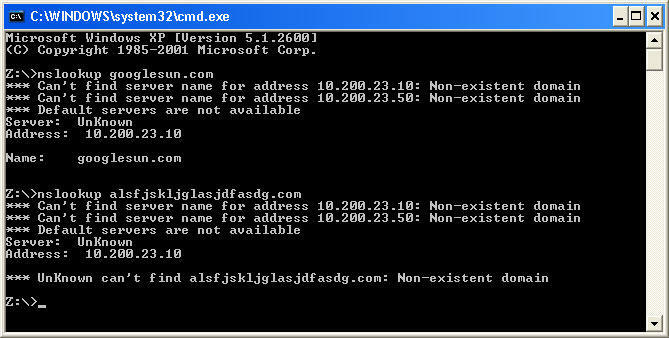 Attached is a screenshot that shows what my DNS server is giving me when I do a lookup on googlesun.com. Usually when you look up a domain that doesnt exist, you recieve a different response. Is anybody else getting the same information? "Google's Chris Uhlik (who ran the Gmail and Toolbar teams) told me at Foocamp 2004 that Google was working on Calendaring (expected soon too)." via Scobleizer. and some time ago Google hired project manager for StarOffice. so GoogleOffice looks like matter of time.